Illinois Attorney General Lisa Madigan said her investigators have discovered allegations of sexual abuse against more than 500 additional clergy. NBC 5's Patrick Fazio reports. 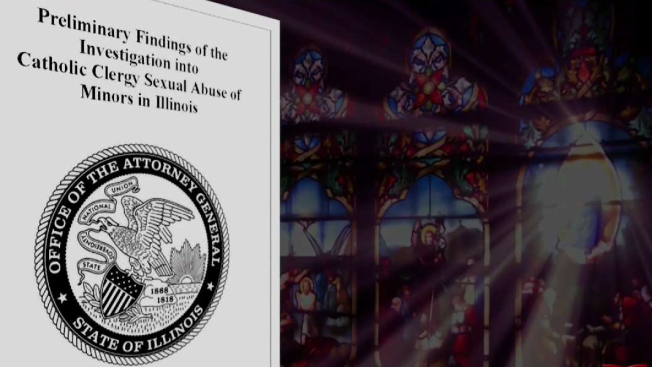 A sweeping investigation of Catholic clergy sexual abuse by the office of Illinois Attorney General Lisa Madigan, contends that abuse of minors in Illinois is “significantly more extensive” than the six dioceses in Illinois have previously reported. Madigan says that in the four months since her office initiated its inquiry, Diocesan offices across the state have acknowledged an additional 45 previously undisclosed clergy who they deemed “credibly” accused of sexually abusing minors. But, she said her investigators have discovered allegations of sexual abuse against more than 500 additional clergy. Madigan’s investigators suggested they found evidence that Church officials had effectively looked the other way on many cases. The report says officials found dozens of examples where Illinois diocesan offices failed to perform adequate investigations, often citing the fact that a clergy member was either deceased or had resigned from ministry when the allegation was first reported. The AG’s investigators said only the Archdiocese of Chicago and the Diocese of Joliet had compiled and published a list of clergy who had been credibly accused of sexual abuse. And by Wednesday evening, officials in the Chicago Archdiocese were pushing back against the attorney general’s findings. “I want to express again the profound regret of the whole church for our failures to address the scourge of clerical sexual abuse,” Cardinal Blasé Cupich said in a statement. And his general counsel Bill Kunkel took that one step further. The Chicago Archdiocese noted that it had set up a hotline for reporting sexual abuse as far back as 1992. Kunkel stated bluntly, “the problem is not a current problem.” And he challenged Madigan’s finding of 500 new names. Nevertheless, Madigan called on Catholic Bishops who are scheduled to meet in Mundelein next month, to directly address the issue.